An endless story, Pompeii attracts travelers to the ruins by Vesuvius – the world’s most dangerous volcano. 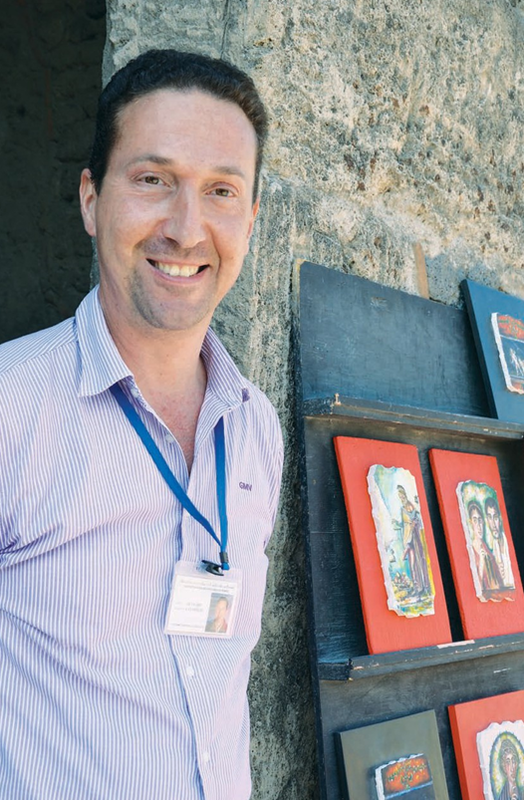 Buon giorno, sei pronto!” This is Signor Gennaro, he’s an expert historian and guide on the ruins of Pompeii and has been leading visitors here for the last 30 years. Dressed for the occasion and wearing comfortable walking shoes, sporty sunglasses and an umbrella to protect against the shimmering sun, he begins our tour by handing me an elaborate map of Pompeii. We enter the ruins, a UNESCO World Heritage site at Porta Marina and he quickly points out the Terme Suburane—a thermal bath on our left. 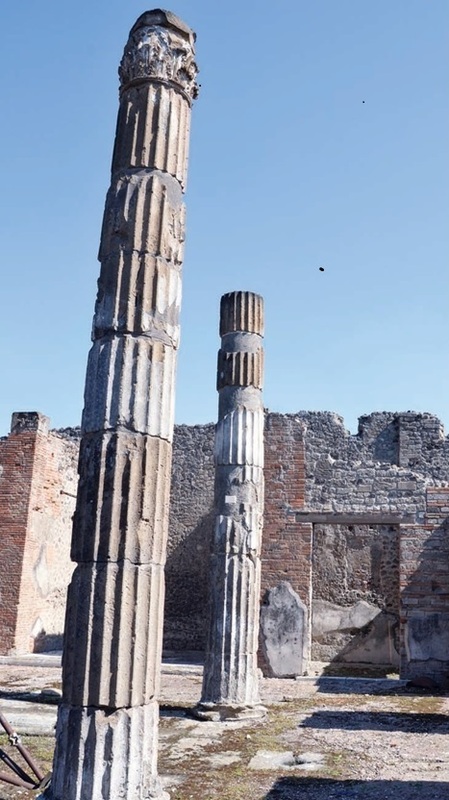 We continue along the via Marina and instantly you can see what life was like before Vesuvius violently erupted on August 24, 79 A.D.
Until the eruption, Pompeii was a rich and prosperous hub with traders, merchants and travelers. It was also a cosmopolitan city populated with a sophisticated society including the Romans, who flocked here for their sun-drenched vacations. After Vesuvius erupted, the Roman city remained buried and undiscovered for almost 1,700 years, until excavation began in 1748. The excavations that followed and continue today provide insight into life during the Roman Empire. We walk along the via Abbondanza, an organized street system lined with polygonal stone, and come to the Foro or city center. It’s a majestic place lined with columns and arches leaving you only to imagine its importance in ancient times. We pass ancient villas, temples, marketplaces and bathhouses all exotically named: Casa del Fauno (the God of dance), Casa dell Venere in Conchiglia (the God of Venus in her sea shell) and the Villa dei Misteri (villa of mysteries) depicting the magnitude of a culture that existed over 2000 years ago. Historians note that Pompeii was founded around the sixth century by the Osci and then captured by the Romans in 80BC. It took its name from the Oscan word pompe, for the number five, because it was composed of five hamlets. “It was a bustling city of lawyers, bankers, doctors, writers, wine makers and philosophers. People were social, liberated and worked hard while enjoying life. Eating, drinking, relaxing and being entertained were very important in their culture,” Signor Gennaro explains. “For example, the ancient people that existed here started their day with breakfast or jentaculum. The upper class ate bread, honey, ricotta cheese, fruit, bread and olives, while honey and ricotta were fed to children for their nutritional value. At midday everyone stopped for lunch or prandium (similar to the Italian word pranzo) and it was served at a thermopolium.” His Neapolitan dialect lets me know that he is from this part of southern Italy. The thermopoliums were snack bars where lunch, snacks and wine were sold. The word thermopolium dates back to ancient Greek and translates to cook shop. Because lunches were quick, light and always eaten outside of home, the thermopliums were a popular place where everyone gathered. There were about 200 prosperous bar cafes of this kind at the time of the eruption. Ancient Remnants – Columns and ruins still stand. 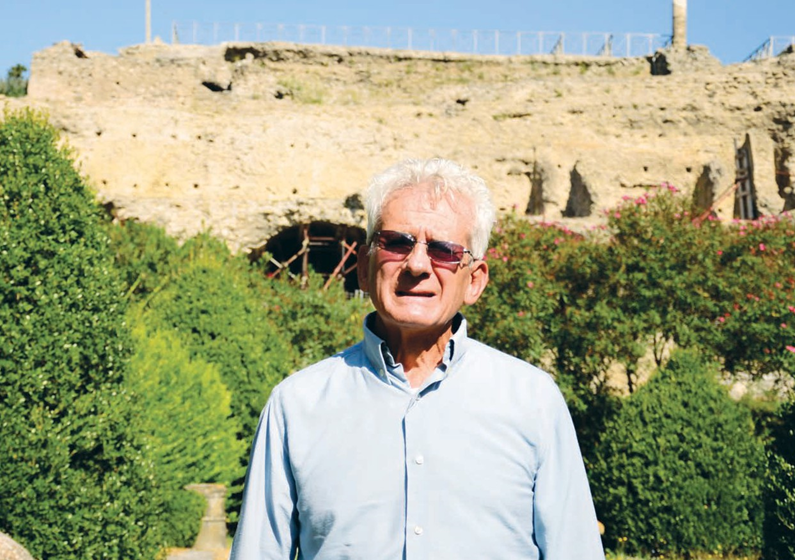 As we walk along the via Fortuna by the Arco Onorario, Signor Gennaro points out the largest thermopolium in the ruins. “The thermopoliums were L shape, built of mortar and stone and had a flagstone countertop. Built into the countertop were earthenware storage spaces called dolias where food was stored,” he says. “A cauponae was different from a thermopolium,” he explains. “They were l’osterias that served full course cenam or dinner. Everyone, at home or eating out, dined at 6 p.m. and the meal included six or seven courses starting with soup and continuing with meat, fish, vegetables and fruits—both fresh and dried, olives, cheese and cake. Dessert or mensa seconda (literally meaning the second meal) was always the finale and included sweet cakes made with anise seed and drenched in honey, fruitcakes, puddings, eggs with sweet sauce, and sweet cheeses. Wine was always served at each meal,” he adds. The poor family’s food was different and included porridge, barley, millet or wheat and leftovers. Light soups made with lentils, beans or chickpeas were served for lunch, and dinners included porridges or soups. “Let’s walk to the Vicolo del Panottiere, the street of the bread makers or panifici.” As we enter the quarter immediately you see dome-shaped ovens built into stone walls. “The ancients ate bread at every meal and it was plentiful. The panificio was a daily stop for everyone—rich or poor,” he says. Bread bakeries had their own mills, ground their grains, baked the bread and sold it onsite. Bread was made with flour and yeast and baked in large round shapes that were scored on top (before being cooked) that marked it into eight equal pieces. This allowed the loaves to bake evenly without cracking open. The markings also carved out equal and individual portions for the baker, who would later sell it to customers lined up at the door. Families in general bought their bread and did not make it at home because not everyone had an oven. Bread bakers also stamped their emblem on each loaf guaranteeing its origin and tied it in a string for easy carrying. Focaccia and pita bread were also popular. The lower classes couldn’t afford bread made with yeast, so they bought and ate unleavened flatbread such as pita bread. Bread dough was also fried and rubbed with olive oil and spices like the pizzette of today. Bread was a main staple in the food culture. Pompeii had thirty-three prosperous bread bakeries in operation at the time of the eruption. The food of Pompeii was very vibrant thanks to the fertile slopes of Vesuvius and its micro-climate. The sea air and rain kept the terrain moist and the mountains in the backdrop held the moisture and the sun’s warmth in. Vegetables and fruits grew abundantly and were consumed by all. Vineyards and wine production made Pompeii the most important commercial center for its wine trade. Wine was an important part of the food culture, and drinking wine was a very democratic practice enjoyed by all—women, slaves and the lower classes. It was also part of their religion, as people worshiped Bacchus, the god of wine, for healthy harvests. The wines of Campania were so good that they were considered the wines of the emperors. But the wine of this time was not fermented in the same way it is today and was very strong. In order to correct the wine, it was boiled or blended with sea water and was even mixed with honey and was called muslum. In colder months, the wine was seasoned with orange zest and spices, served warm and was called punch caldi. Wine was stored in amphoraes, which were tall, large earthenware vessels that were tapered at the bottom. Each amphorae was stamped with the wine maker’s emblem insuring its origin—very similar to the modern DOP or domain of production that we know of today. Pliny the Elder, a historian and author during the period of Pompeii’s prosperity, wrote extensively on wine in the Naturalis Historia. There he names the grape varieties: Greco, Fiano, Aglianico, Piedirosso, Sciascinoso, Coda di Volpe, Caprettona and Falanghina. 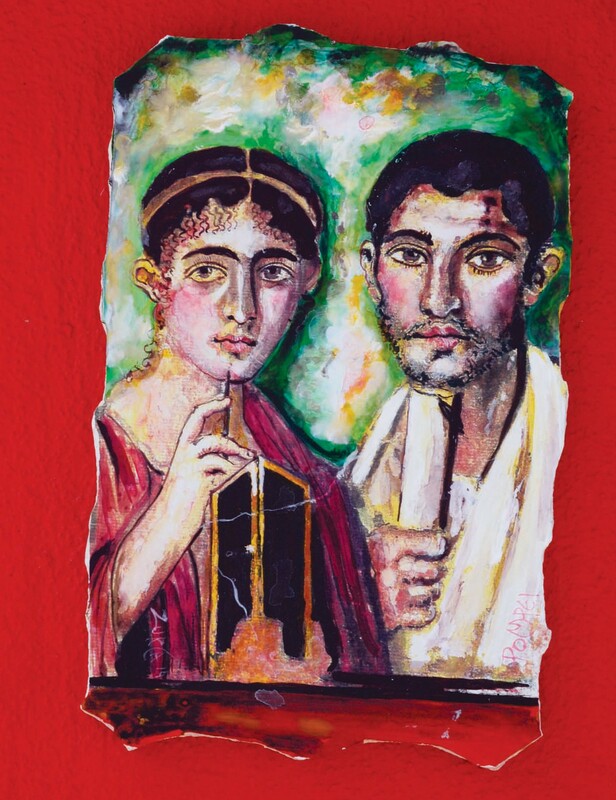 Modern-day historians confirmed that Pliny’s grapes were the same varieties that were painted in frescoes that were found in Pompeii, based on their shape and root print. The same grape varieties are grown in Campania today. “In Vino Veritas,” a famous quote by Pliny, translates to “in wine there is truth,” Gennaro smiles. Food was just as important as wine, he adds. One glimpse into Apicious, the ancient Roman cookbook, and you’ll see the many ingredients and the methods of preparation that were used. They ate cabbage, lettuce, arugula, chicory, thistles, asparagus, pumpkin, squash and citrus fruits including lemons. They consumed lots of vegetables—gourds, sprouts, cauliflower, leeks, horseradish, watercress, carrots, celery, garlic, onions, poppy, chard, leeks, turnips, watermelons, cucumbers, beans, horseradish, cardons, nettle, parsnips, capers and mallow. Nuts such as walnuts, hazelnuts, almonds, and pine nuts were used in almost every recipe. Olives and olive spreads were also popular. Spices were used and herbs extensively and included oregano, basil, mint, nutmeg, laurel, cloves, mustard, pepper, coriander, cumin and fennel. The ancients were great fruit growers who also dried pears, figs, raisins, cherries, pears, grapes and apples in the summer to carry them through the winter, Gennaro says. “Dates were the only food that was imported,” he notes. Signor Gennaro recites just about every food imaginable that you would find in their kitchen. Another important cooking ingredient was garum. It was a spicy fish sauce that came from a process of layering fish and salt and putting it in the sun to dry for three months. Once fermented, the liquid that was extracted was called garum. “People then bought garum in large quantities that were made by the garum artisans in Pompeii; it was a prosperous business. Garum was often mixed with wine and called oenogarum, diluted with water and called hydrogarum, and blended with vinegar and called oxygarum,” he says. With the city’s proximity to the sea, octopus, squid, mullet, sea bass, snails and prawns were eaten in abundance. Fish was grilled, boiled, salted, smoked, pickled, stuffed and even made into patties. Pork, poultry, hare, pigeons, duck, figpeckers (a type of bird), flamingo and ostrich were stuffed or cooked with prunes or red fruits and seasoned with honey. Honey and wine were used to flavor food, while salt was used to preserve it. Defrutum and sapa, cooked wines, were also used in ancient recipes as a sweetener. The concept of farm-raised fish was already in practice and people bred fish in their water fountains for cooking. Although some people raised their own food products, they also bought them at the macellum or market. As our day in Pompeii comes to an end, we pass the Temple of Venus before heading to the exit. It’s a majestic temple overlooking a field of rosemary. The Goddess of Venus was considered mother of the universe, love and beauty. She was highly worshiped because she was born from the sea, and the sea allowed Pompeii’s rich trade. After a long day walking the ruins Signor Gennaro invites me to lunch at a Pompeiano restaurant. “Let’s try the ancient tasting menu at il Principe, the Michelin star restaurant in the center of Pompeii,” he says. It includes dishes like uova di quaglia all’Oxigarum (quail eggs in garum sauce) and calamaro ripieno su cream du cipolla caramellata, defrutum e fave (calamari stuffed with fava beans, cream of onion and reduced vinegar sauce) and la cassata di Opiontis dalla villa di Poppea (sweet cheese cake with honey and candied fruit). “You’ll be eating like a gladiator!” Gennaro smiles. Remove the crust from the bread and slice the loaf. Cut each slice diagonally to form triangles. Mix equal amounts of vinegar and water and lightly moisten the bread. Arrange the slices in a shallow dish using a fan pattern. Mix with the grated cheese and tomatoes. add to the mortar. Grind it into the garlic and peppercorns to make a rough paste. At this stage, adding a pinch of sea salt will aid with the maceration. Add the olive oil and white wine vinegar to the crushed mixture, mixing well. 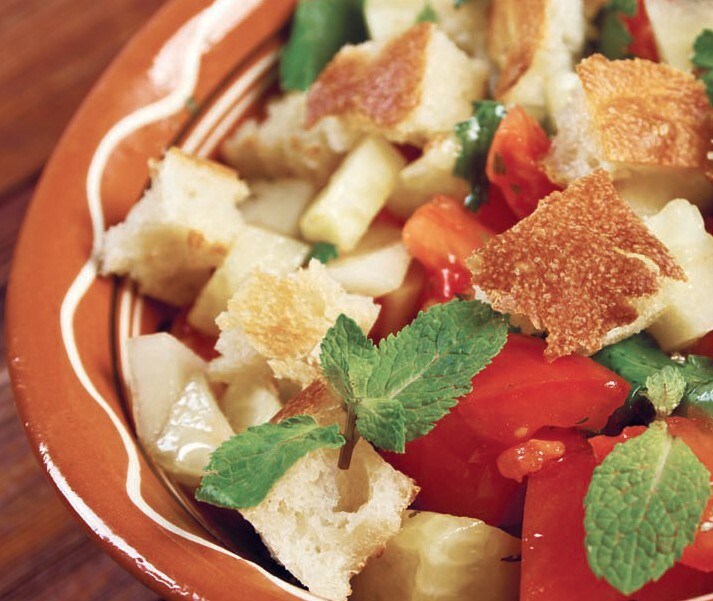 Pour over the bread slices, chill, and serve with mint. the lobster meat along with the garum and pepper. Mix well. Form small patties and fry them in a little olive oil. Mix the ingredients together. Pour into a nonstick pan without any additional oil. Fry on both sides before placing in a serving dish. Pepper to taste on top before serving. 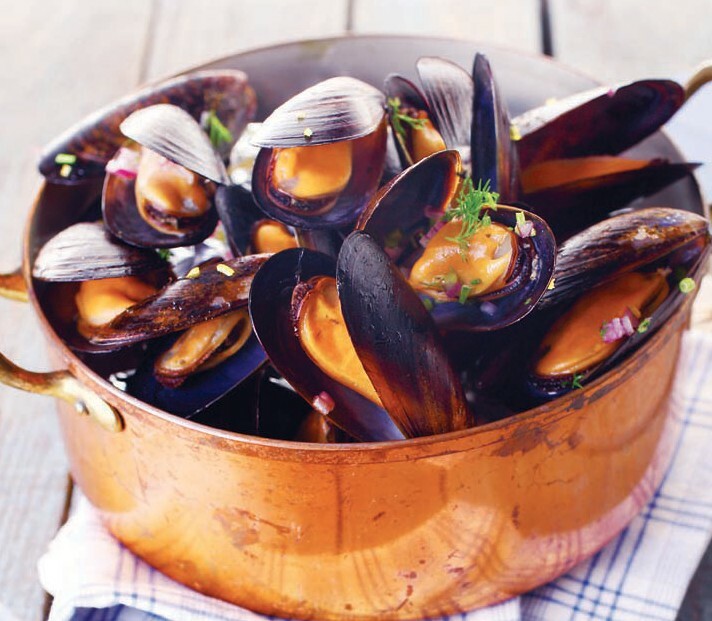 Wash the mussels thoroughly to remove the sand, then simmer them in just enough water to cover, along with the remaining ingredients. Simmer until all mussels have opened, about 5 to 10 minutes. Discard any unopened mussels. This dish is eaten with no further seasoning, as in the Neapolitan sauté of clams and mussels. Lauren Birmingham Piscitelli is founder and owner of Cooking Vacations Italy which specializes in culinary tours, hands-on cooking classes and cultural adventures in Italy. Be sure to visit their website at http://www.cooking-vacations.com. This entry was posted in Blog, Culture, History, Italy, Pompeii, Tourist, Travel and tagged Ancient Ruins, Culture, Food, History, Italy, Pompeii, Tourist, Travel, Vineyards, Volcano, wine. Bookmark the permalink.